No Cost Small Business Advertising: You have nothing to lose. Many small businesses start off with a shoestring operating budget and can’t afford to spend thousands of dollars on advertising. So here are a few free advertising tips to help you save a bit of cash. Write a press release. One of the best free methods of advertising is writing a press release. It can be a story about how you got started, a grand opening, or about a special product or service that you offer. Make your press release interesting and avoid making it sound like an ad for your business. People love to read success stories. Once you’re done writing it, submit it to your local news outlets and/or submit it online. Some free places to post it would be www.pr.com, www.free-press-release.com, and www.openpr.com. Get a website. Websites are a great tool for advertising. Most purchases are initiated by online product or service searches. If you’re just starting out, you can take advantage of companies that offer free website templates and hosting. There are several companies out there that have sites that allow you to design your own website without needing any special training. It is however, a good idea to get a professional site done once your business is fully up and running, but until you have the required funds, a free site will do just fine. The initial goal is to have an online presence. Some companies to check out are www.fireproofdomains.com, www.weebly.com and www.bravenet.com. Once your website is set up, there are tons of free directories that will let you market your website. Check out http://webseodesign.com/resources/free-directory-listings.htm . This will give you a good start. Join professional online forums. Forums are a great way to advertise your business. The key is to not go in advertising your company. The first thing you need to do is build some relationships and participate in some of the online discussions. Once people start becoming familiar with you, that’s when you start mentioning special offers or discounts. Please be subtle. Write a blog. Try www.blogger.com or www.wordpress.com. Write about things that are related to your industry. You start building credibility when you give great advice and tips relating to your industry. Check around for free local networking events. You have to get out there and let people know about your company. Networking events allow you to get your company name out there and it also allows you to pick up some tips from other entrepreneurs that have been doing it for a while. You can learn a lot from them and possibly avoid some of the mistakes they made when initially starting out. This is also a great way to get some free service. Networking events put you in a position to barter. Say for example you need a website done or an article published in a magazine, you may be able to offer them your product/service in exchange for their product/service. This will help you get established without having to come out of pocket. 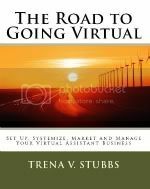 Are You Using a Virtual Assistant to Generate Leads?